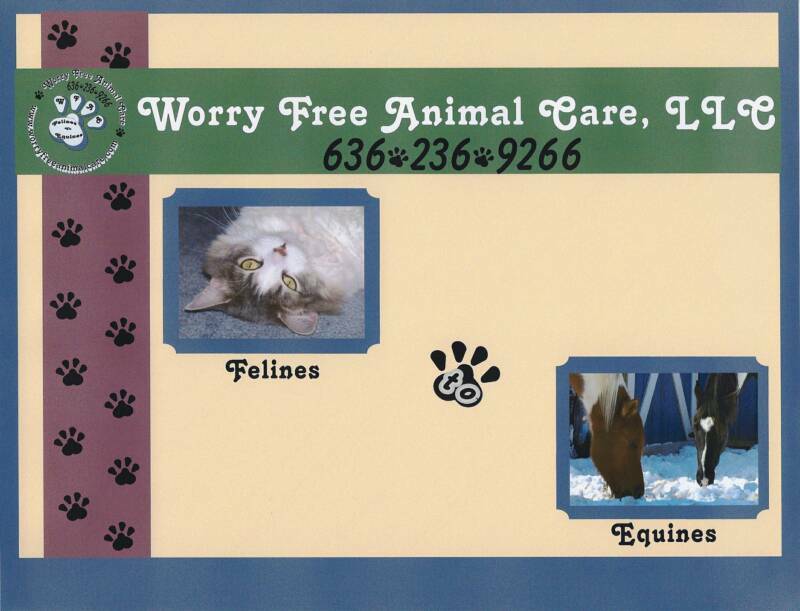 Worry Free Animal Care is a professional in-home pet sitting service provider. Created not only with our needs as humans in mind, but also with the needs and happiness of our animals too. We are independently owned and operated, fully bonded and insured. Certified in pet CPR & first aid by a PetTech instructor and we are a proud member of Professional United Pet Sitters. Based in West St. Louis County (Wildwood) we have restricted our service area to this location and adjacent Franklin County to better serve our customers. We have a variety of pet services at affordable rates, so you won't have to impose on family, friends or neighbors to care for your animals in your absence. Plus your home will look occupied with our in-home services which include simple everyday tasks for your house and property. Not only will you be providing your animals with the care they deserve, you will be making your home look more secure in your absence. 2010 Worry Free Animal Care, LLC. All Rights Reserved.